Can other people’s beliefs about us affect our beliefs about ourselves? Can a perfect stranger be a perfect friend? 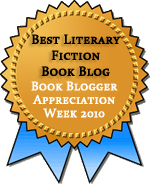 In the world of Miss Pettigrew, yes—for a day anyway. The story begins when Miss Pettigrew’s employment agency sends her to a luxurious London flat to inquire about a position as a governess. Alone and friendless, Miss Pettigrew is desperate for a job, even if she hates being a governess. But when she arrives at the home of nightclub singer Delysia Lafosse, she doesn’t even get a chance to ask about the job before she’s drafted to help solve Miss Lafosse’s romantic problems—and those of her friends. Before long, she’s drawn into Miss Lafosse’s circle and having experiences she thought were only confined to movie screens. Miss Pettigrew Lives for a Day by Winifred Watson was first published in 1938, and it’s now perhaps the most popular title released by Persephone Books, a publisher specializing in reprinting little-known 20th-century books, mostly by women. I’ve heard about Persephone for years, even before I started blogging, but I’ve never read any of their books, although I have a few on the TBR pile. My first Persephone turned out to be not one of those lovely grey books, but an audiobook, read by Frances McDormand. And if the other Persephone books are as enjoyable as this one, I have some wonderful books to look forward to. The two central characters were terrific creations. It was wonderful to watch Miss Pettigrew put aside some of her prudery and take on some confidence under the influence of Miss Lafosse. Miss Lafosse just decides on very little evidence that Miss Pettigrew is capable and interesting and a good companion, and that’s what Miss Pettigrew becomes. And Miss Pettigrew assumes that Miss Lafosse can exhibit self-control and make smart choices, and that’s what Miss Lafosse does. The two women are perfect complements to each other, each supplying what the other needs—and even better, helping the other find those needed qualities in herself. The question the reader has to ask is whether these changes will stick beyond this one day. I enjoyed this book quite a lot for its comedy and its light approach to questions of identity and choice. The book doesn’t read like it has something profound to say, but the power of friendship is a profound thing, and we see that through the characters’ actions. There were a few times when I wanted to scream at Miss Pettigrew for her lack of confidence in herself and in her new friends’ willingness to accept her, but I think that’s part of the story. I can see that these people will embrace her, but Miss Pettigrew can’t; she’s had years of not being embraced, so why would think things would change now? Plus, the class divisions in 1930s London probably made Miss Pettigrew’s worries more well-grounded than they would be today. My only other complaint is one that I think will only annoy listeners to the audio book but will be less of a problem for print readers. Watson goes way overboard with her adverbs in dialogue (I say critically). I’m not against this usage in every instance, but there were stretches of dialogue where Watson includes an adverb in every line (I say emphatically). Now, in print, my eye might have skimmed right over those words without taking them in (I say thoughtfully), but on audio, they really stuck out (I say disappointedly). I warmly recommend this book, with an encouragement that you seek it out in print, instead of audio. Miss Pettigrew Lives for a Day was one of my favorite books last year. I also think the print edition is one of the cutest little books I own. Great review! Cori: All the Persephone books are just lovely to look at. I had so much fun reading this and fell in love with Persephone Books because of it. I wish you had read it in print instead. kiss a cloud: Yeah, I think the dialogue would have been much less frustrating in print. I still enjoyed it, though. I never read this but saw the movie, I loved it! To be honest, I didnt realise it was a book, but now i know.. I think Il have to read it! imsonotablogger: I think the movie brought this book to a lot of people’s attention. I saw the movie at Christmas and it was absolutely delightful (to get in the Pettigrew linguistic spirit). I have the book to read and will pick it up when I need a boost to the morale. I think you need the right mood for it. litlove: You definitely need to be in the book for light and frothy when you pick this one up. I’ve been reading some dark stuff lately, and this was a nice change. I read this book towards the end of last year, and was absolutely enthralled. It’s such a feel-good happy book, and sometimes, that’s all you need! undertainprinciples: Exactly! A happy story is sometimes just the right thing. Not every book needs to be profound (and I think there’s a bit of profundity lurking even in this light little book). I loved this Cinderella story – it was so light and frothy and a quick read that left you feeling in a good mood. The print version also has lovely jazz-age style illustrations too. I’ve got the film now and am looking forward it as I love Amy Adams and Frances McDormand. Annabel: Oh, I bet the illustrations are lovely. I haven’t seen the film yet either, but I think it’s in my Netflix queue. I read this one last year and don’t remember the effusive use of adverbs, so you may be right that they would be less jarring in print. And like you, I did want to throttle Miss Pettigrew a few times throughout the book, but by the end I was won over. It was a gentle but spirited novel, and I quite enjoyed it (though I don’t think it’s a favorite for me). I would also say that the film was quite well done, so you might consider checking that out too! Steph: Yes, I probably wouldn’t have noticed the adverbs in print. On audio, McDormand had to shift from character to voice to narrator voice quite quickly, and it made them really stand out. And I could understand Miss Pettigrew’s fretfulness. It occurred to me after posting that she just doesn’t understand people who come at new people and experiences with a desire to be accepting, and that’s what Miss Lafosse and her friends do. (Maybe too much, in the case of Nick.) Miss Pettigrew, on the other hand, starts from a position of suspicion. Both women have to see some of the value of the other mind-set before they can be happy. Like Litlove, I have seen the charming movie but have not read the novel yet. Looking forward to it though. And I love the way Steph just described it – “gentle but spirited.” As much as I love Frances McDormand, I don’t know if I would enjoy the audio version. Have not had much luck in that department. Think it is the whole pacing thing. Prefer to set the pace in my own head maybe. Frances: It’s taken me a while to really get the hang of listening to audio books–and part of that has involved figuring out what kinds of books work well on audio. I picked up the habit when I had a long commute and wasn’t getting much reading done. Other than the dialogue, this was exactly the kind of book I like on audio. Short, simple, easy to follow. I thought the movie was charming; the book too, but a bit dated. I love the name Delysia Lafosse – delicious! Jenny: All the names were wonderful! Delysia, Edythe DuBarry, Guinevere, Mrs Brummigan. I didn’t realize this was a book, but I should have known since it seems a ton of movies are coming from books these days. I’m glad I haven’t seen the movie yet because your review definitely makes me want to read the book first (or instead). hello! thank you for your review. 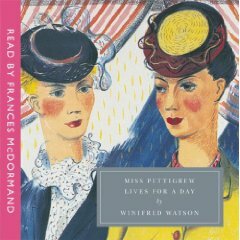 I wanted to let you know I added a link to your review here http://unbridledenthusiasm.net/2015/02/23/miss-pettigrew-lives-for-a-day-by-winifred-watson-1938/ . regards! Hi. Though I’ve never read the book, I watched the movie, and thought it was very effective and affecting. From what you say, however, there was one difference I vaguely sense, and that is that I don’t recall Miss Pettigrew in the movie being quite as faint-hearted as what you are saying the book suggests. Probably a Hollywood choice. As to your conversation with Frances about what books are good on audio, I’d like to make a suggestion (though one which takes us far from the stately confines of London luxury): that’s the book “A Thousand Acres,” by Jane Smiley. My mother and I listened to it together in fits and starts, and both thought it was very effective as an audiobook. I was later prompted to read the book itself, and so got a good and complete view of how the narrative worked. Just a thought.